As per usual I’ve come back from the farmer’s market laden with bags chock full of vegetables that I barely have room for in my tiny kitchen. Only the other week the fridge was so crammed with swiss chard that the door wouldn’t shut properly and there were bushy beetroot leaves were protruding from the overflowing cupboard. I hate food waste so I try not to go to mad but there are usually a few whimsical purchases that I have no idea what I’m going to do with. One such purchase was a load of mud encrusted yellow carrots. There’s something alluring about golden veg (see golden beetroot cake recipe) and different colour vegetables than what you can normally buy in the supermarket. Oh how I wish the supermarket offered a more exciting range – I did see purple carrots in Sainsbury’s, which was very surprising. Although I had wanted to do something more exciting with these golden wonders, on the day I came to cook with them it was a foul grey day with lashing rain and havoc causing winds so they were just crying out to be used in a winter warming nutritious soup. 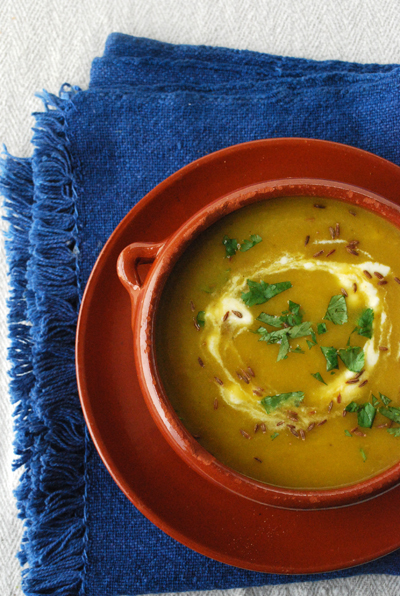 I found that the yellow carrots have a more subtle flavour than their orange relatives and produced a beautiful soup which I enhanced by the warmth of cumin and ginger. Use orange carrots in this recipe if you can’t find the yellow variety and it will still be delicious. Roasting the carrots with the honey and cumin, too, brings out the natural sweetness and gives a deeper flavour than just frying in the pot. Try and use a full bodied, rich and aromatic honey which will add another note of flavour to the beautiful carrots. If there is any left this soup freezes really well but don’t add the fresh corriander. Preheat the oven to 180C/350F/Gas 4. Scrub the carrots (no need to peel) and chop into small even sized chunks. Spread out on an oven tray and add a glug of rapeseed oil, the honey, cumin seeds and some salt and pepper. Mix together so the carrots are coated evenly and put in the oven for about 35-40 minutes, depending on the size of your carrots. Shake the tray half way through so they become caramelised and golden on both sides. Meanwhile, add some rapeseed oil to a large pot and gently sweat the onion and celery with a pinch of salt until soft, translucent and beginning to take on a bit of colour. This should take about 8-10 minutes. Grate in the garlic and ginger and cook for a further 2 minutes whilst stirring to ensure the garlic doesn’t burn. The aroma wafting up is wonderful. Add the cooked carrots to the pot and the vegetable stock and bring up to the boil. Simmer for 15 minutes then turn off the heat and blend the soup to a smooth consistency. Taste and adjust the seasoning as necessary. To serve add some freshly chopped corriander, a swirl of yogurt and some extra toasted cumin seeds, if you like. This entry was posted in Recently cooked and tagged Carrot soup, carrots, carrots with ginger, cumin, ginger, golden carrot soup, Golden carrots on 28/11/2012 by Val McArthur.